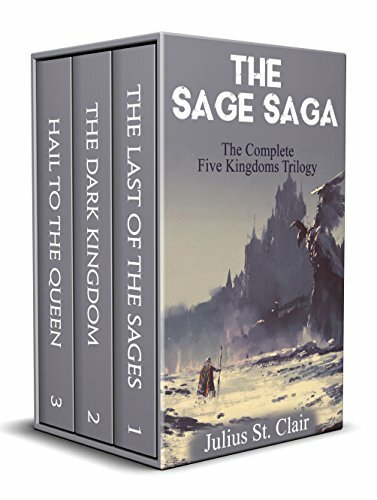 From #1 best-selling epic fantasy author, Julius St. Clair, comes the trilogy that started it all: THE LAST OF THE SAGES: THE COMPLETE FIVE KINGDOMS TRILOGY (BOOKS 1-3). In the kingdom of Allay, Sages are born. Powerful warriors with supernatural abilities that would rival the strength of whole armies. And there is an academy that trains such warriors, forging them out of young, ordinary students and casting them to the cold unknown. Few survive, but if there is any hope for this now desolate kingdom, the tests must be given to all that enter its walls. The Five Kingdoms Trilogy contains the three novels: The Last of the Sages, The Dark Kingdom, and Hail to the Queen in their entirety.